Magdeburger Joe.com: Where Are Egypt's Christians? Christians in America and Europe worry about the secularisation of their holiday. They have legitimate concerns about Christianity being culturally marginalised. Egypt's Christians have a far more basic worry. Aside from rampant discrimination against Egypt's Coptic Christians, who represent about 15% of Egypt's 80 million people. A serious fear of Egyptian Christian parents is not the assimilation of their children into a Muslim majority but the fear of their daughters being abducted, raped and forced to convert to Islam. 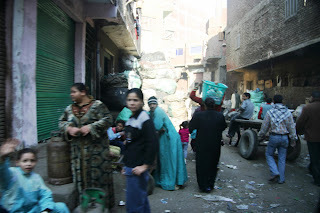 o fearful are many Christians that they prefer to live in a garbage choked section of Cairo inhabited exclusively by Christians, who would rather risk serious illness and death by disease than the loss of their daughters to predatory Muslims who kidnap their daughters under cover of active police collaboration. It is almost impossible to get complaints about abductions of christian girls to be taken by the police, let alone investigated. Assyrian International News Agency reports as follows on cases involving Coptic Christian girls who were kidnapped, raped and forcibly converted to Islam by a Muslim gang that was allowed to act with impunity. Another victim was Amal Zaki from Mahalla el-Kubra. "I received a phone call at work, informing me that my father was taken ill and lies in hospital and wishes to see me urgently. A work colleague with a Burka offered to accompany me. Outside was a car full of sheikhs, and when I refused to get in, I was pushed inside the car, and woke up in a dark room in Dar el Eftah [Al-Azhar affiliated Islamic Legislation Authority]. I knew that I was married to a certain Ahmed Ramadan, the cousin of my Burqa colleague. He tied me to the bed, after three hours I was taken to hospital suffering with haemorrhage." Amal's father continued the story: "I went to State Security and they assured me that they will get her back, but they were just fooling me; they knew all along were my daughter was. When I reported Ahmad Ramadan to the police, he said in the police report that State Security told him to marry Amal, take her to Cairo for conversion to Islam, and after 9 days, they told him to divorce her. He presented documents to support his claims" Amal was returned 9 months later after her father paid a ransom to her abductors. Although she never went to Al-Azhar to convert to Islam, she still got a conversion certificate. The Egyptian government has refused to even extend the minimal protections of dhimmi status to Egypt's Christians. What is done in the name of Islam is simply a rubber stamp for bestial behavior, for the removal of all restraints of human decency. Americans who are free must speak up for Egypt's Christians. Sponsoring them for immigration to the US as well as adopting families that are suffering persecution could go a long way. Egypt's Copts are a living link to early Christianity. Their culture, practices and very existence resonates with Christians abroad. Even those who do not share their faith deeply respect their tenacity in adhering to their traditions. Life is not easy in any Arab country today for its Christian population. In Iraq, Syria, Lebanon and the Palestine Authority there is marginalisation at best and violent intolerance at the worst. Egypt has the largest Christian population of any Arab country, and their life is grim by Western standards. If a Muslim minority in America was being terrorised and persecuted, there would be an outcry from the Islamic world. America's Christians should respond in the same manner to the plight of Egypt's Copts. Non Christians should also ant for Egypt's Copts the freedom we now enjoy in America. Egypt's Muslim majority needs to know that Egypt's Christians matter to the American people. They deserve high priority on any immigration list. If anyone would appreciate the freedoms of our country, it would be Egypt's Christians. The United States was founded as a place of refuge for successive waves of immigrants, from the Quakers and the Puritans and the Huguenots to Jews and also refugees from communist Eastern Europe. We would be unworthy of our proud history as a place of refuge if we were to turn a blind eye to Egypt's Copts. We must let our religious and political leaders know of our concern for Egypt's besieged Christian minority. It may well be by this that our country will be judged. May we not be found wanting. "Al Gore Is An Idiot" Weather in Copenhagen"